We go to great lengths to deliver a shoe as close to perfect as possible. But once they leave us, it’s on you. While some like their sneakers to look a little rough around the edges, we hear from a great many that favor the less-traveled look. 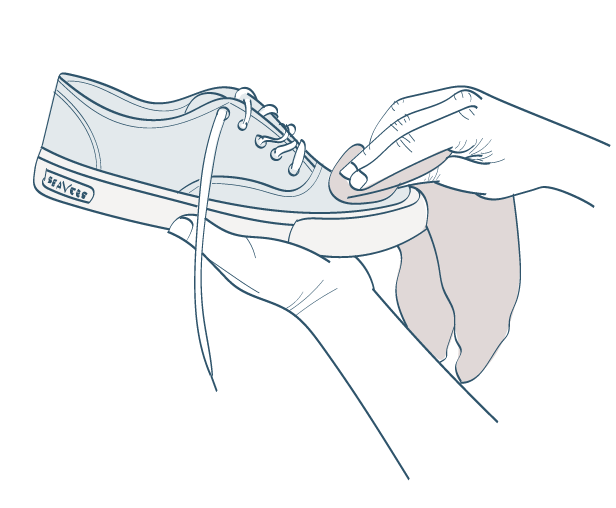 Here are some tips on how to keep your SeaVees cleaner for longer. Protect your sneakers against water, dirt and stains to keep them looking spotless with our Shoe Protector. Before you begin, make sure the shoe you are protecting has a clean, dry surface. Hold the container 6 inches from the surface of the shoe and spray in a back and forth motion. Try to spray thoroughly and evenly including all seams. For best results, allow to dry for 24 hours. Use more frequently in rainy weather. Remove stains and dirt from your shoes with our non-toxic Cleaner & Conditioner. If you’re cleaning a sneaker, simply take a wet shoe brush or cloth, apply a small amount of the cleaner to it and scrub thoroughly. Wipe dry with a clean, dry towel or let it dry naturally (out of direct sunlight). If you’re cleaning a suede or leather shoe, apply a small amount of cleaner to a clean, dry bristle brush. Scrub entire area thoroughly and evenly. Let it dry overnight. Keep your shoes feeling fresh with our new eco-friendly Shoe Refresher. Pull out the footbed, spray it thoroughly and wipe away moisture and dirt using a dry cloth. Wait until it is completely dry before putting back into your shoe.